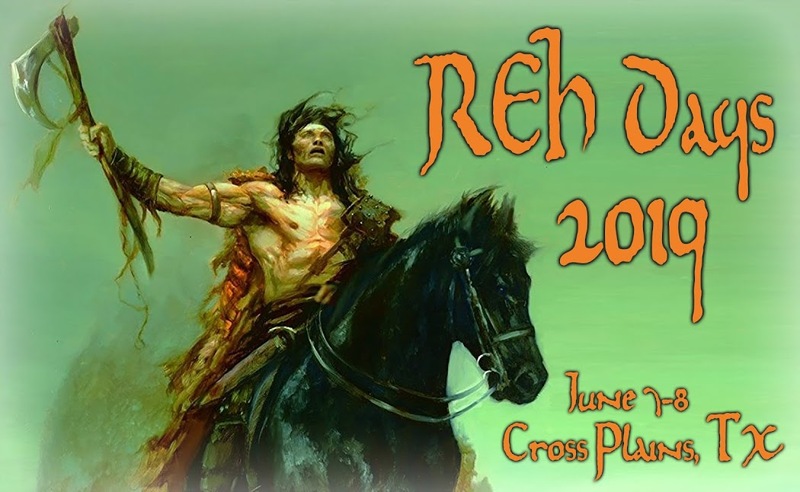 Robert E. Howard Days: Howard Days is Next Week!!! Howard Days is Next Week!!! With Howard Days starting up next week, we thought we'd bring you a few little tips that will (hopefully) make your visit more enjoyable. Remember that a lot of time at Howard Days is outdoors. While the House itself and all the venues for the panels and Banquet are nicely air-conditioned from the hot Texas weather, you will be spending time outside at the open-air Pavilion. Sunscreen is always a good idea, along with liberal doses of bug spray to fight off this year's Texas-sized mosquitoes - and keep yourself hydrated so the heat doesn't sneak up on you. The fine folks of Project Pride do provide bug spray and a huge cooler filled with water and soft drinks, but if you've got a particular brand of bug spray or sunscreen you like, please bring it along. If you've got a soft drink you like and want to share, it's acceptable for you to dump a case of it in the cooler! (Or keep it in your own cooler.) No beers during the day, please - but after hours is fine as long as we keep it at the Pavilion. The House is open to the public Friday and Saturday (June 10-11) from 9 am to 4 pm. It will also be open on Thursday from 2 - 4 pm. This year the Cross Plains Review is opening its doors to Howard Days folks - from 2 - 4 pm on Thursday you can go see what newspapering was like in Howard's day while you view their old presses. There is NO FEE for touring the House, hanging out at the Pavilion, going on the Friday Bus Tour, attending any of the panels, having lunch at the Pavilion on Friday or the BBQ on Saturday or for the provided water & soft drinks. If you registered for the Banquet with your $15.00 fee, that helps defray the costs of the list of activities mentioned above. HOWEVER, there is a Donation Jar set out during these activities so please help out with a couple of pazoors now & then. The Gift Shop in the Howard House is still cash or check only. There are several ATM's located around town. Check out all the scheduling by clicking on the tabs at the top of this page. We'll have a large schedule posted at the Pavilion and you'll get a paper one when you check in at the House. The Pavilion is available to all attendees from Wednesday until the wee hours of Sunday morning, so please feel free to hang out and engage with Howard fans from all over the world - there will be lots of good conversation and fellowship and everyone is welcome. Except for the mosquitoes, that is. One Month Until Howard Days!